The original "Billy Jack" movie. 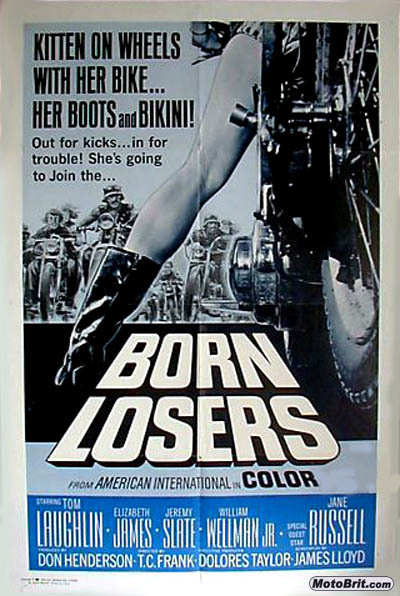 Now that that's out of the way, this movie rates as the best for bikers in fab sunglasses. One of the bikers has a really "far out" pair of shades and another apparently had just finished a stint in a musical, as he does a ballet type (very effeminate) leap off the hood of a car. Two points to show you they're stylish, but it does little to make you believe these guys are rough and tumble. Oh, and beat'n up small girls needs to be added to the laundry list of toughness. I'm not sure how Jane Russell ended up in this, sad on so many levels.